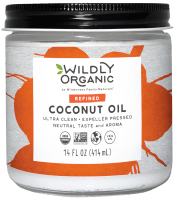 Learn what goes into creating Wildly Organic's organic coconut oils and explore which type of oil is right for you. Buyers lack good information on the different ways coconut oil is produced and how that affects quality, stability, its use, and price. We created this page to help you understand those differences and choose the best oil for your needs. All coconut oils have a few things in common. They are all made from the meat (white flesh) of a mature coconut (10-12 months after the flower begins to form a seed). Water, fiber, and proteins are removed from the flesh of the coconut to obtain the oil. All coconut oil, once these constituents are removed, is stable at room temperature. This oil is more stable than any other oil because it is predominantly composed of medium chain fatty acids which are "saturated" by hydrogen atoms and resist oxidation. Was heat, smoke, or the sun used during the process and how long did it take? Are there still trace amounts of proteins, fibers or water left in the finished oil? Did any contamination occur to the coconut meat or oil as it was dried or processed? There are four basic methods used to produce coconut oil. We sell coconut oil made by three of these processes. The fourth method, fermentation, can vary significantly in quality and we have found it yields the shortest shelf life of all types of coconut oil. Therefore, we have chosen not to offer that type of coconut oil to our customers. Though there may be slight variations, most coconut oils on the market are made in using the following processes. Centrifuged coconut oil is made by first pressing the fresh, white meat of the coconut to obtain a coconut cream. This cream is approximately 40% oil. The pressing should be done on a special machine where both the pressing plate and the sleeve are cooled by chilled water. Using a centrifuge, the cream is then concentrated to yield a higher and higher percentage of oil while the proteins and water-soluble substances are separated out. In the end, this coconut oil has a very light, coconut flavor and most people would consider it to be very mild and smooth. It is typically considered one of the highest quality coconut oils but is also one of the most expensive to produce. This oil should always be labeled as virgin coconut oil. All moisture, fiber, and proteins can be removed without the use of heat, allowing it to be considered raw. 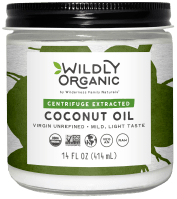 Wildly Organic Centrifuge Extracted Virgin Coconut Oil ranks among the top coconut oils in the country for quality. It is extremely pure and considered raw with a delicious, yet mild coconut flavor. Please note that color, clarity, flavor, and aroma may vary and this is completely normal. Cold pressed coconut oil is made through a process that contains more variables than centrifuged oil, even though the methodology is simple. First, the fresh coconut meat is grated and then dried. This drying process is important to the taste and quality of the oil. Some companies dry the coconut exactly the same as standard desiccated coconut (at 170-180 degrees F). Others dry the coconut at temperatures around 140 or 150 degrees F. Still other manufacturers will dry the coconut meat at temperatures under 103 degrees F. In addition, companies all dry the coconut to varying degrees of moisture. This dried coconut is then pressed at varying degrees of pressure and temperature. This pressing yields oil with proteins which are fine enough to leak out of the press cake while under pressure. These proteins are then either filtered out or allowed to "settle" in settling tanks so the oil can be decanted. The amount of heat that is generated during the processing and the details of the process can vary significantly. This is most likely the reason there is great variation in quality and taste among cold pressed oils. They can have a toasted coconut taste (the result of high heat applied to standard desiccated coconut with very low moisture) or a mild, raw coconut flavor (which results from careful, low-temperature processing) or burnt and/or rancid flavors (the result of poor drying). Wildly Organic Cold Pressed Coconut Oil has a pleasantly mild, coconut flavor and is raw. At this time we are not aware of any other cold pressed coconut oil in America that is raw, organic and has a mild taste. Please note that color, clarity, flavor, and aroma may vary and this is completely normal. The vast majority of coconut oil produced in the world is expeller-pressed. During production, there is little concern about heat, how the coconut meat is dried, or many other aspects of coconut oil manufacture. The coconut meat is dried by a wide variety of methods, usually using the sun or smoke. Once dried, the coconut meat is pressed in large expeller presses that generate heat and pressure. This yields a crude coconut oil that is brown and must be "cleaned". In the end, the free fatty acids (a breakdown product from the oil), any remaining moisture, any bad flavor or smell, etc is minimized by filtering, washing, and refining. Expeller pressed oil is typically the least expensive of all coconut oils. It is sometimes called RBD coconut oil (which stands for refined, bleached and deodorized), but it is generally the same product as expeller pressed coconut oil. We sell this oil because we wanted to offer a lower-priced alternative to premium virgin coconut oil and to suit those who do not like the taste of coconuts. This is our only oil that is not raw and does not taste like coconuts. Since coconut oil is very stable, heating processes and cleaning processes do not harm the oil. Our Organic Expeller Pressed Coconut Oils are never processed using solvents such as hexane. It took us some time to discover an expeller pressed coconut oil we could proudly put our name on. We call ours "Ultra Clean Supreme" Expeller Pressed Coconut Oil. We use this special designation because the oil is shipped out of Asia to Europe, where it is thoroughly cleaned a second time - this time the right way. All impurities are removed and the resulting oil is very pure, light, delicate and dreamy. It can be used to create delicate pastries and crusts, to sautée or deep fat fry. Because of its purity, it has a long shelf-life, a high smoke point and is extremely versatile. No one else in America carries this oil — a true exclusive for our customers. Please note that color, clarity, flavor, and aroma may vary and this is completely normal.